Barbados (/bɑːrˈbeɪdɒs/ ( listen) or /-doʊs/) is an island country in the Lesser Antilles of the West Indies, in the Caribbean region of North America. It is 34 kilometres (21 miles) in length and up to 23 km (14 mi) in width, covering an area of 432 km2 (167 sq mi). It is situated in the western area of the North Atlantic and 100 km (62 mi) east of the Windward Islands and the Caribbean Sea; therein, Barbados is east of the Windwards, part of the Lesser Antilles, roughly at 13°N of the equator. It is about 168 km (104 mi) east of both the countries of Saint Lucia and Saint Vincent and the Grenadines and 400 km (250 mi) north-east of Trinidad and Tobago. Barbados is outside the principal Atlantic hurricane belt. Its capital and largest city is Bridgetown. The name “Barbados” is from either the Portuguese term Os Barbados or the Spanish equivalent, Los Barbados, both meaning “the bearded ones”. It is unclear whether “bearded” refers to the long, hanging roots of the bearded fig-tree (Ficus citrifolia), indigenous to the island, or to the allegedly bearded Caribs who once inhabited the island, or, more fancifully, to a visual impression of a beard formed by the sea foam that sprays over the outlying reefs. In 1519, a map produced by the Genoese mapmaker Visconte Maggiolo showed and named Barbados in its correct position. Furthermore, the island of Barbuda in the Leewards is very similar in name and was once named “Las Barbudas” by the Spanish. 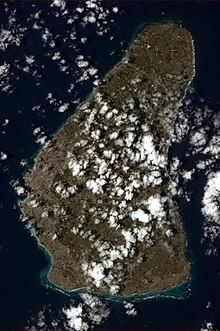 The original name for Barbados in the Pre-Columbian era was Ichirouganaim, according to accounts by descendants of the indigenous Arawakan-speaking tribes in other regional areas, with possible translations including “Red land with white teeth” or “Redstone island with teeth outside (reefs)” or simply “Teeth”. Colloquially, Barbadians refer to their home island as “Bim” or other nicknames associated with Barbados, including “Bimshire”. The origin is uncertain, but several theories exist. The National Cultural Foundation of Barbados says that “Bim” was a word commonly used by slaves, and that it derives from the Igbo term bém from bé mụ́ meaning ‘my home, kindred, kind’, the Igbo phoneme [e] in the Igbo orthography is very close to /ɪ/. The name could have arisen due to the relatively large percentage of enslaved Igbo people from modern-day southeastern Nigeria arriving in Barbados in the 18th century. The words ‘Bim’ and ‘Bimshire’ are recorded in the Oxford English Dictionary and Chambers Twentieth Century Dictionaries. Another possible source for ‘Bim’ is reported to be in the Agricultural Reporter of 25 April 1868, where the Rev. N. Greenidge (father of one of the island’s most famous scholars, Abel Hendy Jones Greenidge) suggested the listing of Bimshire as a county of England. Expressly named were “Wiltshire, Hampshire, Berkshire and Bimshire”. Lastly, in the Daily Argosy (of Demerara, i.e. Guyana) of 1652, there is a reference to Bim as a possible corruption of ‘Byam’, the name of a Royalist leader against the Parliamentarians. That source suggested the followers of Byam became known as ‘Bims’ and that this became a word for all Barbadians. Reproduction of the Blue Ensign flag of the Colony of Barbados, used from 1870 to 1966. In the very early years (1620–1640s) the majority of the labour was provided by European indentured servants, mainly English, Irish and Scottish, with enslaved Africans and enslaved Amerindian providing little of the workforce. During the Cromwellian era (1650s) this included a large number of prisoners-of-war, vagrants and people who were illicitly kidnapped, who were forcibly transported to the island and sold as servants. These last two groups were predominately Irish, as several thousand were infamously rounded up by English merchants and sold into servitude in Barbados and other Caribbean islands during this period. Cultivation of tobacco, cotton, ginger and indigo was thus handled primarily by European indentured labour until the start of the sugar cane industry in the 1640s and the growing reliance and importation of enslaved Africans. Persecuted persons of Jewish faith during the inquisition also settled to Barbados. From its English settlement and as Barbados’s economy grew, Barbados maintained a relatively large measure of local autonomy first as a proprietary colony and later a crown colony. The House of Assembly began meeting in 1639. Among the island’s earliest leading figures was the Anglo-Dutch Sir William Courten. The 1780 hurricane killed over 4,000 people on Barbados. In 1854, a cholera epidemic killed over 20,000 inhabitants. At emancipation in 1833, the size of the slave population was approximately 83,000. Between 1946 and 1980, Barbados’s rate of population growth was diminished by one-third because of emigration to Britain. The first English ship, which had arrived on 14 May 1625, was captained by John Powell. The first settlement began on 17 February 1627, near what is now Holetown (formerly Jamestown), by a group led by John Powell’s younger brother, Henry, consisting of 80 settlers and 10 English labourers. The latter were young indentured labourers who according to some sources had been abducted, effectively making them slaves. Courten’s title was transferred to James Hay, 1st Earl of Carlisle, in what was called the “Great Barbados Robbery.” Carlisle then chose as governor Henry Hawley, who established the House of Assembly in 1639, in an effort to appease the planters, who might otherwise have opposed his controversial appointment. In the period 1640–60, the West Indies attracted over two-thirds of the total number of English emigrants to the Americas. By 1650 there were 44,000 settlers in the West Indies, as compared to 12,000 on the Chesapeake and 23,000 in New England. Most English arrivals were indentured. After five years of labour, they were given “freedom dues” of about ₤10, usually in goods. (Before the mid-1630s, they also received 5 to 10 acres (2 to 4 hectares) of land, but after that time the island filled and there was no more free land.) Around the time of Cromwell a number of rebels and criminals were also transported there. Timothy Meads of Warwickshire was one of the rebels sent to Barbados at that time, before he received compensation for servitude of 1000 acres of land in North Carolina in 1666. Parish registers from the 1650s show, for the white population, four times as many deaths as marriages. The death rate was very high. Before this, the mainstay of the infant colony’s economy was the growth export of tobacco, but tobacco prices eventually fell in the 1630s, as Chesapeake production expanded. Around the same time, fighting during the War of the Three Kingdoms and the Interregnum spilled over into Barbados and Barbadian territorial waters. The island was not involved in the war until after the execution of Charles I, when the island’s government fell under the control of Royalists (ironically the Governor, Philip Bell, remaining loyal to Parliament while the Barbadian House of Assembly, under the influence of Humphrey Walrond, supported Charles II). To try to bring the recalcitrant colony to heel, the Commonwealth Parliament passed an act on 3 October 1650 prohibiting trade between England and Barbados, and because the island also traded with the Netherlands, further navigation acts were passed prohibiting any but English vessels trading with Dutch colonies. These acts were a precursor to the First Anglo-Dutch War. The Commonwealth of England sent an invasion force under the command of Sir George Ayscue, which arrived in October 1651. After some skirmishing, the Royalists in the House of Assembly led by Lord Willoughby surrendered. The conditions of the surrender were incorporated into the (Treaty of Oistins), which was signed at the Mermaid’s Inn, Oistins, on 17 January 1652. The introduction of sugar cane from Dutch Brazil in 1640 completely transformed society and the economy. Barbados eventually had one of the world’s biggest sugar industries. One group instrumental in ensuring the early success of the industry were the Sephardic Jews, who had originally been expelled from the Iberian peninsula, to end up in Dutch Brazil. As the effects of the new crop increased, so did the shift in the ethnic composition of Barbados and surrounding islands. The workable sugar plantation required a large investment and a great deal of heavy labour. At first, Dutch traders supplied the equipment, financing, and enslaved Africans, in addition to transporting most of the sugar to Europe. In 1644 the population of Barbados was estimated at 30,000, of which about 800 were of African descent, with the remainder mainly of English descent. These English smallholders were eventually bought out and the island filled up with large sugar plantations worked by enslaved Africans. By 1660 there was near parity with 27,000 blacks and 26,000 whites. By 1666 at least 12,000 white smallholders had been bought out, died, or left the island. Many of the remaining whites were increasingly poor. By 1680 there were 17 slaves for every indentured servant. By 1700, there were 15,000 free whites and 50,000 enslaved Africans. 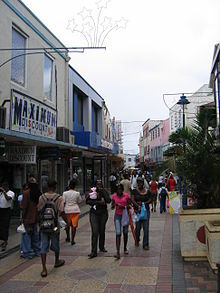 In the parish of Saint Michael lies Barbados’s capital and main city, Bridgetown. 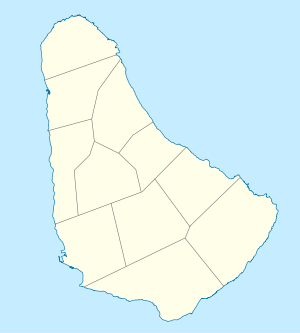 Other major towns scattered across the island include Holetown, in the parish of Saint James; Oistins, in the parish of Christ Church; and Speightstown, in the parish of Saint Peter. Barbados lies on the boundary of the South American and the Caribbean Plates. The subduction of the South American plate beneath the Caribbean plate scrapes sediment from the South American plate and deposits it above the subduction zone forming an accretionary prism. The rate of this depositing of material allows Barbados to rise at a rate of about 25 mm (1 in) per 1,000 years. This subduction means geologically the island is composed of coral roughly 90 m (300 ft) thick, where reefs formed above the sediment. The land slopes in a series of “terraces” in the west and goes into an incline in the east. A large proportion of the island is circled by coral reefs. The country generally experiences two seasons, one of which includes noticeably higher rainfall. Known as the “wet season“, this period runs from June to December. By contrast, the “dry season” runs from December to May. Annual precipitation ranges between 1,000 and 2,300 mm (40 and 90 in). From December to May the average temperatures range from 21 to 31 °C (70 to 88 °F), while between June and November, they range from 23 to 31 °C (73 to 88 °F). Infrequent natural hazards include earthquakes, landslips, and hurricanes. Barbados is often spared the worst effects of the region’s tropical storms and hurricanes during the rainy season. Its location in the south-east of the Caribbean region puts the country just outside the principal hurricane strike zone. On average, a major hurricane strikes about once every 26 years. The last significant hit from a hurricane to cause severe damage to Barbados was Hurricane Janet in 1955; in 2010 the island was struck by Hurricane Tomas, but this caused only minor damage across the country. Barbados is susceptible to environmental pressures. As one of the world’s most densely populated isles, the government worked during the 1990s to aggressively integrate the growing south coast of the island into the Bridgetown Sewage Treatment Plant to reduce contamination of offshore coral reefs. As of the first decade of the 21st century, a second treatment plant has been proposed along the island’s west coast. Being so densely populated, Barbados has made great efforts to protect its underground aquifers. As a coral-limestone island, Barbados is highly permeable to seepage of surface water into the earth. The government has placed great emphasis on protecting the catchment areas that lead directly into the huge network of underground aquifers and streams. On occasion illegal squatters have breached these areas, and the government has removed squatters to preserve the cleanliness of the underground springs which provide the island’s drinking water. Close to 90% of all Barbadians (also known colloquially as “Bajan”) are of Afro-Caribbean descent (“Afro-Bajans“) and mixed-descent. The remainder of the population includes groups of Europeans (“Anglo-Bajans” / “Euro-Bajans”) mainly from the United Kingdom and Ireland, along with Asians, predominantly Chinese and Indians (both Hindu and Muslim). Other groups in Barbados include people from the United Kingdom, United States and Canada. Barbadians who return after years of residence in the United States and children born in America to Bajan parents are called “Bajan Yankees”, a term considered derogatory by some. Generally, Bajans recognise and accept all “children of the island” as Bajans, and refer to each other as such. Euro-Bajans (4% of the population) have settled in Barbados since the 17th century, originating from England, Ireland and Scotland. In 1643, there were 37,200 whites in Barbados (86% of the population). More commonly they are known as “White Bajans“. Euro-Bajans introduced folk music, such as Irish music and Highland music, and certain place names, such as “Scotland”, a mountainous region. Among White Barbadians there exists an underclass known as Redlegs; mostly the descendants of Irish indentured labourers and prisoners imported to the island. Many additionally moved on to become the earliest settlers of modern-day North and South Carolina in the United States. Today the Redlegs only number around 400. Chinese-Barbadians are a small portion of Barbados’s Asian demographics. Most if not all first arrived in the 1940s during the Second World War. Many Chinese-Bajans have the surnames Chin, Chynn or Lee, although other surnames prevail in certain areas of the island. Chinese food and culture is becoming part of everyday Bajan culture. Lebanese and Syrians form the island’s Arab Barbadian community, which is overwhelmingly Christian Arab. The Muslim Arab minority among Arab Barbadian make up a small percentage of the overall minority Muslim Barbadian population. The majority of the Lebanese and Syrians arrived in Barbados through trade opportunities. Their numbers are falling due to emigration to other countries. Most Barbadians of African and European descent are Christians (95%), the largest denomination being Anglican (40%). 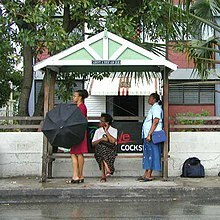 Other Christian denominations with significant followings in Barbados are the Catholic Church (administered by Roman Catholic Diocese of Bridgetown), Pentecostals, Jehovah’s Witnesses, the Seventh-day Adventist Church and Spiritual Baptists. The Church of England was the official state religion until its legal disestablishment by the Parliament of Barbados following independence. Other religions in Barbados include Hinduism, Islam, Bahá’í, Judaism and Wicca. 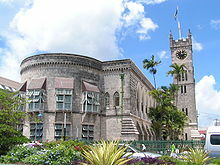 The Barbados parliament building in Bridgetown. During the 1990s at the suggestion of Trinidad and Tobago‘s Patrick Manning, Barbados attempted a political union with Trinidad and Tobago and Guyana. The project stalled after the then prime minister of Barbados, Lloyd Erskine Sandiford, became ill and his Democratic Labour Party lost the next general election. Barbados continues to share close ties with Trinidad and Tobago and with Guyana, claiming the highest number of Guyanese immigrants after the United States, Canada and the United Kingdom. Barbados functions as a two-party system. The dominant political parties are the Democratic Labour Party and the incumbent Barbados Labour Party. Since Independence on 30 November 1966, the Democratic Labour Party (DLP) has governed from 1966 to 1976; 1986 to 1994; and from 2008 to 2018; and the Barbados Labour Party (BLP) has also governed from 1976 to 1986; 1994 to 2008; and from 2018 to present. The Democratic Labour Party government (DLP) held office with the then incomparable 1st Premier of Barbados became Prime Minister of Barbados, Errol Barrow from 4 December 1961 to 3 November 1966; 3 November 1966 to 9 September 1971; and from 9 September 1971 to 2 September 1976; and again from 28 May 1986 until his sudden death in office on 1 June 1987 for the then 4th Prime Minister of Barbados, Sir. Lloyd Sandiford with the Democratic Labour Party government (DLP) from 1 June 1987 to 20 January 1991; and from 20 January 1991 to 6 September 1994; the Barbados Labour Party government (BLP) held office with the then incomparable Prime Minister of Barbados, Tom Adams from 2 September 1976 to 18 June 1981; and from 18 June 1981 until his sudden death in office on 11 March 1985 for the then incomparable 3rd Prime Minister of Barbados, Sir. Harold St. John with the Barbados Labour Party government (BLP) from 11 March 1985 to 28 May 1986; the Barbados Labour Party government (BLP) held power from 6 September 1994 to 20 January 1999; 20 January 1999 to 21 May 2003; and from 21 May 2003 to 15 January 2008; the Democratic Labour Party government (DLP) held power with the then incomparable 6th Prime Minister of Barbados, David Thompson from 15 January 2008 until his death in office on 23 October 2010 for the then 7th Prime Minister of Barbados, Freundel Stuart with the Democratic Labour Party government (DLP) from 23 October 2010 to 21 February 2013; and from 21 February 2013 to 24 May 2018 for the general elections for the new Barbados Labour Party government (BLP). All of Barbados’s Prime Ministers, except Freundel Stuart, held under the Ministry of Finance’s portfolio. The Barbados Labour Party government (BLP) held power with the now 8th Prime Minister of Barbados, Mia Mottley from 24 May 2018 to present. Barbados is a full and participating member of the Caribbean Community (CARICOM), CARICOM Single Market and Economy (CSME), and the Association of Caribbean States (ACS). Organization of American States (OAS), Commonwealth of Nations, and the Caribbean Court of Justice (CCJ). In 2005 the Parliament of Barbados voted on a measure replacing the UK’s Judicial Committee of the Privy Council with the Caribbean Court of Justice based in Port of Spain, Trinidad and Tobago. The Barbados Defence Force has roughly 600 members. Within it, 12- to 18-year-olds make up the Barbados Cadet Corps. The defence preparations of the island nation are closely tied to defence treaties with the United Kingdom, the United States, and the People’s Republic of China. Harrison’s Cave and Welchman Hall Gully have been developed as tourist attractions. Business links and investment flows have become substantial: as of 2003 the island saw from Canada CA$25 billion in investment holdings, placing it as one of Canada’s top five destinations for Canadian foreign direct investment (FDI). Businessman Eugene Melnyk of Toronto, Canada, is said to be one of Barbados’s richest permanent residents. The European Union is assisting Barbados with a €10 million program of modernisation of the country’s International Business and Financial Services Sector. Barbados’ outstanding debt climbed to US$7.5 billion in May 2018, more than 1.7 times higher the country’s GDP. In June 2018 the government refused to pay coupon on Eurobonds maturing in 2035. Outstanding bond debt of Barbados reached US$4.4 billion. The culture of Barbados is a blend of West African, Portuguese, Creole, Indian and British cultures present in Barbados. Citizens are officially called Barbadians. The term “Bajan” (pronounced BAY-jun) may have come from a localised pronunciation of the word Barbadian, which at times can sound more like “Bar-bajan”; or, more likely, from English bay (“bayling”), Portuguese baiano. The largest carnival-like cultural event that takes place on the island is the Crop Over festival, which was established in 1974. As in many other Caribbean and Latin American countries, Crop Over is an important event for many people on the island, as well as the thousands of tourists that flock to there to participate in the annual events. The festival includes musical competitions and other traditional activities, and features the majority of the island’s homegrown calypso and soca music for the year. The male and female Barbadians who harvested the most sugarcane are crowned as the King and Queen of the crop. Crop Over gets under way at the beginning of July and ends with the costumed parade on Kadooment Day, held on the first Monday of August. New calypso/soca music Is usually released and played more frequently from the beginning of may to start the feeling of the festival. Bajan cuisine is a mixture of African, Indian, Irish, Creole and British influences. A typical meal consists of a main dish of meat or fish, normally marinated with a mixture of herbs and spices, hot side dishes, and one or more salads. The meal is usually served with one or more sauces. The national dish of Barbados is Cou-Cou & Flying Fish with spicy gravy. Another traditional meal is “Pudding and Souse” a dish of pickled pork with spiced sweet potatoes. A wide variety of seafood and meats are also available. The Mount Gay Rum visitors centre in Barbados claims to be the world’s oldest remaining rum company, with earliest confirmed deed from 1703. Cockspur Rum and Malibu are also from the island. Barbados is home to the Banks Barbados Brewery, which brews Banks Beer, a pale lager, as well as Banks Amber Ale. Banks also brews Tiger Malt, a non-alcoholic malted beverage. 10 Saints beer is brewed in Speightstown, St. Peter in Barbados and aged for 90 days in Mount Gay ‘Special Reserve’ Rum casks. It was first brewed in 2009 and is available in certain Caricom nations. 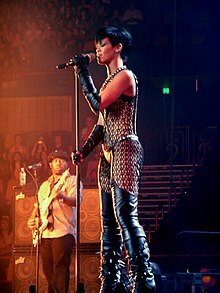 In music, nine-time Grammy Award winner Rihanna (born in Saint Michael) is one of Barbados’s best-known artists and one of the best selling music artists of all time, selling over 200 million records worldwide. In 2009 she was appointed as an Honorary Ambassador of Youth and Culture for Barbados by the late Prime Minister, David Thompson. Singer-songwriters Rayvon and Shontelle, the band Cover Drive, musician Rupee and Mark Morrison, singer of Top 10 hit “Return of the Mack” also originate from Barbados. Grandmaster Flash (born Joseph Saddler in Bridgetown in 1958) is a hugely influential musician of Barbadian origin, pioneering hip-hop DJing, cutting, and mixing in 1970s New York. The Merrymen are a well known Calypso band based in Barbados, performing from the 1960s into the 2010s. 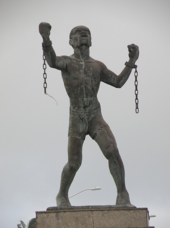 28 April National Heroes’ Day A day of recognition for Barbados’s national heroes since 28 April 1998. Harrison’s cave– Opened in 1981, Harrison cave is noted for its extremely pure water. Flowers Forest Park– in the village of Saint Joseph of Bloomsbury. Hillaby mountain– Hillaby, at approximately 340 meters above sea level is the highest point of the East Caribbean mountains. Kensington Oval in Bridgetown hosted the 2007 Cricket World Cup final. Cricket is one of the most followed games in Barbados and Kensington Oval is often referred to as the “Mecca in Cricket” due to its significance and contributions to the sport. As in other Caribbean countries of British colonial heritage, cricket is very popular on the island. The West Indies cricket team usually includes several Barbadian players. In addition to several warm-up matches and six “Super Eight” matches, the country hosted the final of the 2007 Cricket World Cup. Barbados has produced many great cricketers including Sir Garfield Sobers, Sir Frank Worrell, Sir Clyde Walcott, Sir Everton Weekes, Gordon Greenidge, Wes Hall, Charlie Griffith, Joel Garner, Desmond Haynes and Malcolm Marshall. Horse racing takes place at the Historic Garrison Savannah close to Bridgetown. Spectators can pay for admission to the stands, or else can watch races from the public “rail”, which encompasses the track. Basketball is an increasingly popular sport, played at school or college. Barbados’s national team has shown some unexpected results as in the past it beat many much larger countries. Polo is very popular amongst the rich elite on the island and the “High-Goal” Apes Hill team is based at the St James’s Club. It is also played at the private Holders Festival ground. In golf, the Barbados Open, played at Royal Westmoreland Golf Club, was an annual stop on the European Seniors Tour from 2000 to 2009. In December 2006 the WGC-World Cup took place at the country’s Sandy Lane resort on the Country Club course, an 18-hole course designed by Tom Fazio. The Barbados Golf Club is another course on the island. It has hosted the Barbados Open on several occasions. Barbadian team The Flyin’ Fish, are the 2009 Segway Polo World Champions. A Hino ACME Minibus B 163 in Speightstown, St. Peter, Barbados. Transport on the island is relatively convenient with “route taxis” called “ZRs” (pronounced “Zed-Rs”) travelling to most points on the island. These small buses can at times be crowded, as passengers are generally never turned down regardless of the number. They will usually take the more scenic routes to destinations. They generally depart from the capital Bridgetown or from Speightstown in the northern part of the island. Including the ZRs, there are three bus systems running seven days a week (though less frequently on Sundays). There are ZRs, the yellow minibuses and the blue Transport Board buses. A ride on any of them costs Bds$ 2. 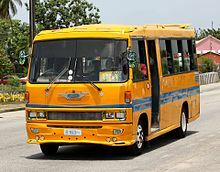 The smaller buses from the two privately owned systems (“ZRs” and “minibuses”) can give change; the larger blue buses from the government-operated Barbados Transport Board system cannot, but do give receipts. 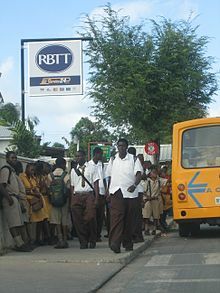 The Barbados Transport Board buses travel in regular bus routes and scheduled timetables across Barbados. Schoolchildren in school uniform including some Secondary schools ride for free on the government buses and for Bds$ 2 on the ZRs. Most routes require a connection in Bridgetown. Barbados Transport Board’s headquarters are located at Kay’s House, Roebuck Street, St. Michael, and the bus depots and terminals are located in the Fairchild Street Bus Terminal in Fairchild Street and the Princess Alice Bus Terminal (which was formerly the Lower Green Bus Terminal in Jubilee Gardens, Bridgetown, St. Michael) in Princess Alice Highway, Bridgetown, St. Michael; the Speightstown Bus Terminal in Speightstown, St. Peter; the Oistins Bus Depot in Oistins, Christ Church; and the Mangrove Bus Depot in Mangrove, St. Philip. The island’s lone airport is the Grantley Adams International Airport. It receives daily flights by several major airlines from points around the globe, as well as several smaller regional commercial airlines and charters. The airport serves as the main air-transportation hub for the eastern Caribbean. In the first decade of the 21st century it underwent a US$100 million upgrade and expansion in February 2003 until completion in August 2005. ^ “Barbados – General Information”. GeoHive. Archived from the original on 1 February 2017. Retrieved 16 December 2013. ^ “Barbados”. 29 August 2006. Archived from the original on 15 October 2007. (fco.gov.uk), updated 5 June 2006. ^ a b Sauer, Carl Ortwin (1969) . Early Spanish Main, The. University of California Press. pp. 192–197. ISBN 0-520-01415-4. ^ Secretariat. “Barbados – History”. Commonwealth of Nations. Archived from the original on 20 August 2014. ^ HRM Queen Elizabeth II (2010). 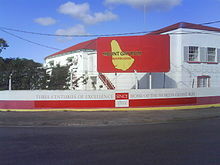 “History and present government – Barbados”. The Royal Household. Archived from the original on 10 October 2012. Retrieved 10 May 2010. ^ “AXSES Systems Caribbean Inc., The Barbados Tourism Encyclopaedia”. Barbados.org. 8 February 2007. Archived from the original on 16 January 2000. Retrieved 4 July 2010. ^ “Britannica Encyclopaedia: History of Barbados”. Britannica.com. Archived from the original on 13 September 2010. Retrieved 4 July 2010. ^ Barbados – Geography / History. Fun ‘N’ Sun Publishing Inc. 2008. Archived from the original on 13 December 2010. Retrieved 14 May 2010. ^ Faria, Norman (17 June 2009). “Guyana Consul (Barbados) Visit to Former Amerindian Village Site in B’dos” (PDF). Guyana Chronicle. Pan-Tribal Confederacy of Indigenous Tribal Nations. p. 2. Archived from the original (PDF) on 24 May 2016. Retrieved 14 May 2010. Adjacent to the park, there is still a fresh water stream. This as a main reason the village was here. A hundred or so metres away is the sea and a further five hundred metres [550 yd] out across a lagoon was the outlying reef where the Atlantic swells broke on the coral in shallow waters. As an aside, the word “Ichirouganaim“, said to be an Arawak word used by the Amerindians to describe Barbados, is thought to refer to the “teeth” imagery of the waves breaking on the reefs off most of southern and eastern coasts. ^ Drewett, Peter (1991). Prehistoric Barbados. 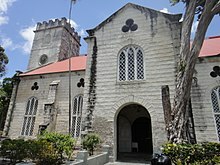 Barbados Museum and Historical Society. ISBN 1-873132-15-8. ^ Drewett, Peter (2000). Prehistoric Settlements in the Caribbean: Fieldwork on Barbados, Tortola and the Cayman Islands. Archetype Publications Ltd. ISBN 1-873132-22-0. ^ Allsopp, Richard; Allsopp, Jeannette (2003). Dictionary of Caribbean English Usage. University of the West Indies Press. p. 101. ISBN 9766401454. ^ Eltis, David; Richardson, David (1997). Routes to Slavery: Direction, Ethnicity, and Mortality in the Transatlantic Slave Trade. Routledge. p. 87. ISBN 978-0-7146-4820-0. Retrieved 24 November 2008. ^ Morgan, Philip D.; Hawkins, Sean (2004). Black Experience and the Empire. Oxford University Press. p. 82. ISBN 0-19-926029-X. ^ “Origin of the Eagle Clan”, Pan-Tribal Confederacy of Indigenous Tribal Nations. ^ Descendants of Princess Marian. (PDF). Retrieved 19 February 2012. ^ Corish, Patrick J. Patrick J. Corish, The Cromwellian Regime, 1650–1660. oup.com. pp. 353–386. doi:10.1093/acprof:oso/9780199562527.003.0014. Archived from the original on 6 April 2016. Retrieved 26 March 2016. ^ “Barbados Archived 29 January 2012 at the Wayback Machine“. Library of Congress Country Studies. ^ “Barbados – population Archived 29 January 2012 at the Wayback Machine“. Library of Congress Country Studies. ^ “Holetown Barbados – Fun Barbados Sights”. www.funbarbados.com. Archived from the original on 12 September 2017. Retrieved 12 September 2017. ^ Karl Watson, The Civil War in Barbados Archived 2 December 2010 at the Wayback Machine, History in-depth, BBC, 5 November 2009. ^ “New Take on George Slept Here”. The Boston Globe. Archived from the original on 4 March 2016. Retrieved 18 October 2017. ^ a b Ali, Arif (1997). Barbados: Just Beyond Your Imagination. Hansib Publishing (Caribbean) Ltd. pp. 46, 48. ISBN 1-870518-54-3. ^ A Relation… in: “Alice Curwen”, Autobiographical Writings by Early Quaker Women (Aldershot, England: Ashgate, 2004), ed. David Booy. ^ Logan, Gabi. “Geologic History of Barbados Beaches”. USA Today. Archived from the original on 22 March 2012. Retrieved 2 July 2011. Barbados lies directly over the intersection of the Caribbean plate and the South American plate in a region known as a subduction zone. Beneath the ocean floor, the South American plate slowly slides below the Caribbean plate. ^ “Barbados Sightseeing – Animal Flower Cave”. Leigh Designs. Little Bay House. 2010. Archived from the original on 12 December 2011. Retrieved 10 July 2011. The Animal flower Cave is the island’s lone accessible sea-cave and was discovered from the sea in 1780 by two English explorers. The cave’s coral floor is estimated to be 400,000 to 500,000 years old and the “younger” coral section above the floor is about 126,000 years old. The dating was carried out by the German Geographical Institute, and visitors can see a “map” of the dating work in the bar and restaurant. The cave now stands some six feet above the high tide mark even though it was formed at sea level. This is because Barbados is rising about one inch per 1,000 years, which is yet another indication of the cave’s age. ^ Gloria. “Pico Teneriffe – Barbados Pocket Guide”. www.barbadospocketguide.com. Archived from the original on 27 November 2016. Retrieved 3 April 2017. ^ “Average and Record Conditions at Bridgetown, Barbados”. BBC Weather. Archived from the original on 20 February 2007. Retrieved 10 September 2009. ^ “Hurricane Tomas lashes Caribbean islands” Archived 5 November 2015 at the Wayback Machine. BBC News, 30 October 2010. ^ Domestic and Industrial Wastewater Treatment Techniques in Barbados Archived 24 July 2013 at the Wayback Machine. Cep.unep.org. Retrieved 20 April 2014. ^ Perspectives: A continuing problem and persistent threat Archived 24 July 2013 at the Wayback Machine. Barbadosadvocate.com. Retrieved 20 April 2014. ^ a b “PERSPECTIVES: Squatting – a continuing problem” Archived 24 July 2013 at the Wayback Machine. Barbadosadvocate.com (24 March 2008). Retrieved 20 April 2014. ^ “Squatters get thumbs down from MP Forde” Archived 21 April 2014 at the Wayback Machine. Nationnews.com (30 June 2010). Retrieved 20 April 2014. ^ “Welcome to Coastal Zone Management Unit – Coastal Zone Management Unit”. Archived from the original on 1 March 2012. Retrieved 24 February 2012. ^ Barbados’ CZMU in demand Archived 24 July 2013 at the Wayback Machine. Barbadosadvocate.com (4 February 2012). Retrieved 20 April 2014. ^ Centre for Resource Management and Environmental Studies Archived 28 November 2012 at the Wayback Machine, The University of the West Indies. ^ Prospero, Joseph M. (June 2006). “Saharan Dust Impacts and Climate Change” (PDF). Oceanography. 19 (2): 60–61. Archived from the original (PDF) on 2015-11-05. ^ The Effects of African Dust on Coral Reefs and Human Health Archived 22 June 2012 at WebCite. Coastal.er.usgs.gov (15 April 2014). Retrieved 20 April 2014. ^ The Impact of African Dust on Childhood Asthma Morbidity in Barbados Archived 24 July 2013 at the Wayback Machine. Commprojects.jhsph.edu. Retrieved April 2014. ^ Caribbean Travel: Swim with the turtles in Barbados Archived 15 March 2012 at the Wayback Machine. Thestar.com (13 March 2012). Retrieved 20 April 2014. ^ Sea Turtles – Dive Operators Association of Barbados Archived 19 March 2012 at the Wayback Machine, Barbados Blue Inc.
^ 2010 Population and Housing Census (PDF) (Report). 1. Barbados Statistical Service. September 2013. p. i. Archived (PDF) from the original on 18 January 2017. Retrieved 17 November 2016. ^ Best, Tony (9 April 2005) “Bajan secrets to living long”. Archived from the original on 11 December 2007. Retrieved 27 June 2006. . nationnews.com. ^ Byfield, Judith Ann-Marie; Denzer, LaRay; Morrison, Anthea (2010). Gendering the African diaspora: women, culture, and historical change in the Caribbean and Nigerian hinterland. Indiana University Press. pp. 39–. ISBN 978-0-253-22153-7. ^ Watson, Karl (17 February 2011) “Slavery and Economy in Barbados” Archived 12 February 2012 at the Wayback Machine, BBC. ^ Rodgers, Nini (November 2007). “The Irish in the Caribbean 1641–1837: An Overview”. Irish Migration Studies in Latin America. 5 (3): 145–156. Archived from the original on 19 November 2017. Retrieved 15 February 2009. ^ “Remnants of an indentured people”. The Irish Times. 19 December 2009. Archived from the original on 22 October 2012. Retrieved 23 January 2019. Today, behind the facade of a lush green, rural setting, the descendents of those transported still remain – a poor, white population of around 400 known as the Red Legs. ^ Amadou Mahtar M’Bow; M. Ali Kettani (2001). Islam and Muslims in the American Continent. Center of Historical, Economical and Social Studies. ^ Rhoda Reddock (1996). Ethnic minorities in Caribbean society. I.S.E.R., The University of the West Indies. ISBN 978-976-618-024-9. ^ “Baha’u’llah”. Bci.org. Archived from the original on 28 August 2010. Retrieved 4 July 2010. ^ Fransman, Laurie (2011). Fransman’s British Nationality Law. A&C Black. p. 848. ISBN 978-1-84592-095-1. ^ The official Constitution of Barbados Archived 15 December 2012 at the Wayback Machine (1966) version. ^ “Chasing after an elusive union”. Archived from the original on 24 June 2009. Retrieved 14 December 2010. . Jamaica Observer, 20 July 2003. ^ “European Union – EEAS (European External Action Service) | EU Relations with Barbados”. Europa (web portal). 19 June 2014. Retrieved 10 November 2018. ^ REPUBLIC OF TRINIDAD AND TOBAGO. “Legal Supplement” (PDF). www.ird.gov.tt. Archived (PDF) from the original on 7 May 2016. Retrieved 27 December 2016. ^ “Barbados turns to China for military assistance”. Caribbean360.com. 7 August 2006. Archived from the original on 17 September 2013. ^ “State Sponsored Homophobia 2016: A world survey of sexual orientation laws: criminalisation, protection and recognition” (PDF). International Lesbian, Gay, Bisexual, Trans and Intersex Association. 17 May 2016. Archived (PDF) from the original on 8 August 2016. Retrieved 11 June 2017. ^ Barbados Archived 10 May 2017 at the Wayback Machine, International Monetary Fund. ^ World Bank – Country Groups Archived 18 March 2011 at the Wayback Machine. Retrieved 5 October 2009. ^ “20 percent in poverty”. Caribbean Broadcasting Corporation. 20 April 2012. Archived from the original on 23 April 2012. Retrieved 22 April 2012. ^ Publications, USA International Business (2007-09-04). Island States: Small Island States Handbook: Development Strategy and Programs. Int’l Business Publications. ISBN 9780739744871. ^ “BBC News – Barbados profile – Overview”. British Broadcasting Corporation. 22 December 2013. Archived from the original on 5 April 2014. Retrieved 6 April 2014. ^ “Latest Socio-Economic Indicators”. Barbados Statistical Service. Archived from the original on 5 November 2015. Retrieved 8 November 2015. ^ “Melnyk – one of the wealthiest”. NationNews.com. 29 October 2011. Archived from the original on 12 December 2013. Retrieved 6 April 2014. ^ Morris, Roy (2 January 2006). “Builders paradise”. The Nation Newspaper. Archived from the original on 4 January 2006. Retrieved 29 July 2009. Industry sources are warning, however, that while the boom will bring many jobs and much income, ordinary Barbadians hoping to undertake home construction or improvement will be hard pressed to find materials or labour, given the large number of massive commercial projects with which they will have to compete. … Construction magnate Sir Charles ‘COW’ Williams, agreeing that this year will be “without doubt” the biggest ever for the island as far as construction was concerned, revealed that his organisation was in the final stages of the construction of a new US$6 million plant at Lears, St Michael to double its capacity to produce concrete blocks, as well as a new US$2 million plant to supply ready-mixed concrete from its fleet of trucks. “The important thing to keep in mind is that the country will benefit tremendously from a massive injection of foreign exchange from people who want to own homes here,” Sir Charles said. ^ Lashley, Cathy (24 July 2009). “Barbados signs agreement with EU”. gisbarbados.gov.bb. Archived from the original on 24 July 2013. Retrieved 29 July 2009. ^ “Treaty network an advantage in securities trading”. Barbados Advocate. 28 July 2009. Archived from the original on 11 February 2006. Retrieved 28 July 2009. ^ “Barbados announced a technical default on coupon of Eurobonds with maturity in 2035”. www.cbonds.com. Archived from the original on 12 June 2018. Retrieved 10 June 2018. ^ “Unesco Institute for Statistics: Date Centre”. 14 September 2007. Archived from the original on 30 January 2011. Retrieved 28 February 2011. ^ “The Education System in Barbados – Business Barbados”. Business Barbados. Archived from the original on 11 May 2015. Retrieved 22 May 2015. ^ “Crop Over Festival”. 2camels.com. Archived from the original on 5 March 2010. Retrieved 30 July 2009. ^ Barbados Food Archived 29 March 2015 at the Wayback Machine. Totally Barbados. Retrieved 25 January 2011. ^ Barbados National Dish: Coucou & Flying Fish Archived 16 June 2011 at the Wayback Machine. Epicurian Tourist. 25 December 2007. Retrieved 21 January 2011. ^  Archived 30 May 2017 at the Wayback Machine.www.barbados.org. Retrieved 28 May 2015. ^ Banks Beer: The Beer Archived 7 July 2011 at the Wayback Machine. BanksBeer.com. Retrieved 2011-3-9. ^ 10 Saints beer Archived 16 May 2017 at the Wayback Machine. BanksBeer.com. Retrieved 2011-3-9. ^ Tokmakoğlu, A. Buğra (16 December 2017). “Barbados’da Görmeniz Gereken 3 Yer | Turna.com”. Turna.com Blog (in Turkish). Archived from the original on 18 January 2018. Retrieved 17 January 2018. ^ Guide, Barbados.org Travel. “Harrison’s Cave, Barbados – The Ultimate Island Attraction”. barbados.org. Archived from the original on 12 June 2018. Retrieved 4 September 2018. ^ Lynne Sullivan (2001). Adventure Guide to Barbados. Hunter Publishing, Inc. pp. 137–. ISBN 978-1-55650-910-0. ^ “Ape hills polo”. Ape hills Club. Archived from the original on 12 January 2015. Retrieved 2 June 2015. ^ Harris, Alan (26 July 2009). “Barbados Segway Polo team 2009 World Champions”. Barbados Advocate. Archived from the original on 15 September 2010. Retrieved 26 July 2009. This article incorporates public domain material from the CIA World Factbook document “2003 edition”.